Celebrating “European Day of Languages”, a project that promotes linguistic and cultural diversity in Europe, ten Cultural Institutes and Embassies – members of EUNIC Warsaw Cluster (EU National Institutes for Culture) – including the Greek Embassy in Warsaw, organized a two days cultural event at Zloty Tarasy , a multifunctional complex in the center of Warsaw (26 & 27/9). 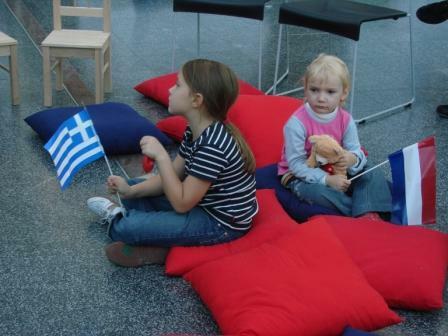 The participation of Greece was coordinated by the Greek Press and Communication Office in Warsaw in collaboration with the Center for Hellenic Studies in Warsaw University. (such as “treasure hunt”), and music events, while participating institutions provided promotional material for the languages involved.